Summary: Drest has lived happily with her father, Grimbol (a.k.a. Mad Wolf) and her older brothers all her life. She knows they are a war band who often go off to fight, yet she has been sheltered from knowing that ferocious and violent side of their lives. When they are all taken captive and carried away in a ship, it’s up to her to rescue them. She finds a wounded knight from the raiding party, and takes him as her captive to help her find the way to the castle where her family members are prisoners. The journey is full of dangerous adventures, but Drest discovers a courage and tenacity she never knew she had. She also hears stories of atrocities committed by her father and brothers and has to reconcile those with the loving men she has grown up with. 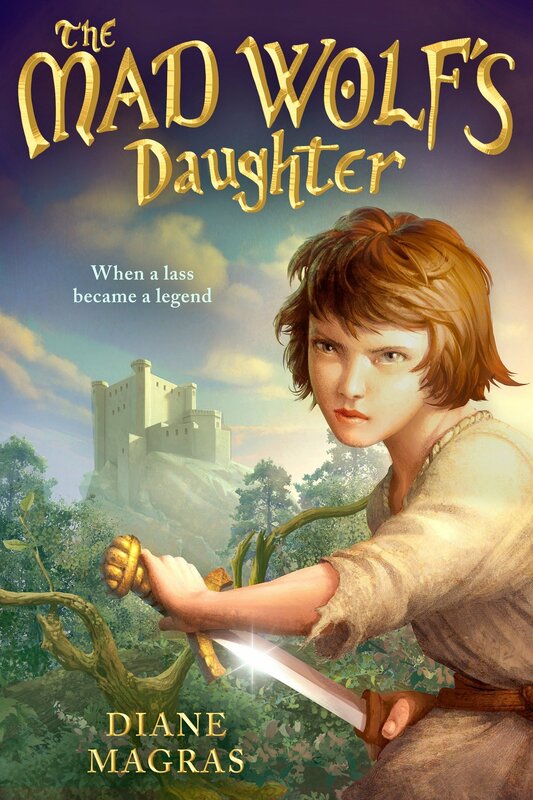 There’s a happy ending, but also enough loose ends for a sequel, The Hunt for the Mad Wolf’s Daughter, which is due out next March. 288 pages; grades 4-7. Pros: Readers will keep turning the pages to read about Drest’s adventures, and in the process, learn more about 13th century Scotland. Cons: Don’t be surprised if readers start flinging medieval Scottish insults at each other, e.g., “You crab-headed squid gut” or “You rot-headed prickle fish”.